Is it Urgent or Important, or Neither, or Both? Do you have a framework to decide? As a leader, how many times do you hear, “We have to make this decision now because this is really important?” The fact is, not everything that is urgent is important. Have you established a framework to determine what’s urgent or important, or neither, or both? If everything is urgent and important, my experience is that you are out of control. The framework I find incredibly successful in clearing out this state of operating comes from Stephen Covey. In his books, The Seven Habits of Highly Effective People and First Things First, Stephen Covey introduces the use of four quadrants to determine what you “need” to do and how to decide what should be made a priority. Quadrant 1 is business critical and mission critical items that must be dealt with immediately. Quadrant 2 is important, but not urgent items – things that are important that need to get done to move your company forward, but you do not have to drop everything now to deal with them. My experience shows if you get this quadrant right, it helps you decide the rest. More on this later. 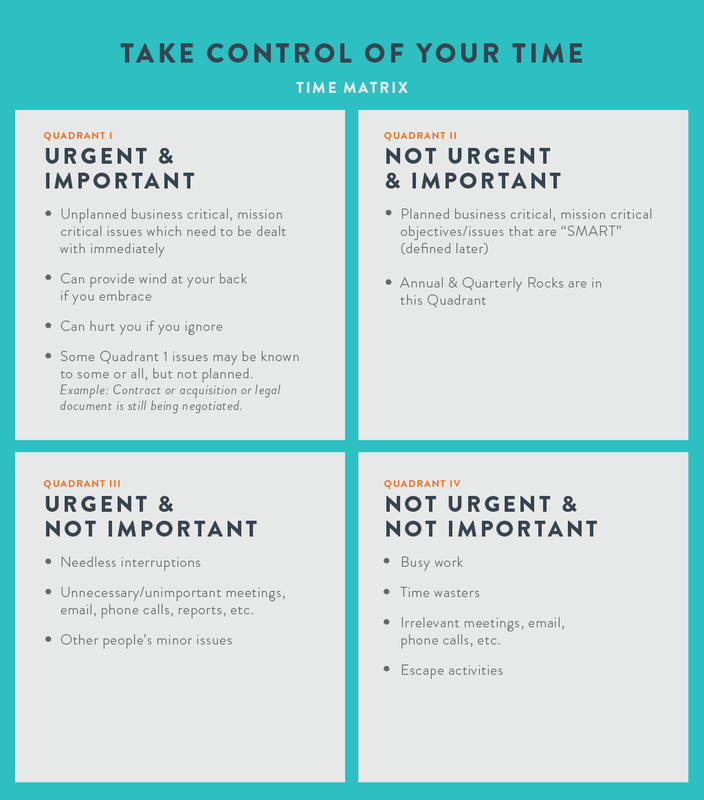 Quadrant 3 is urgent, but unimportant items – if you don’t know how to set priorities, these items will endlessly absorb your time. If you do know how to set priorities, you will say ‘no’ more often than not to these items. Quadrant 4 is unimportant and also not urgent items – enough said. Successful growth companies master Quadrant 2. If you master Quadrant 2, you have the framework, discipline and confidence to know what fits in the other three quadrants. Measurable – quantify the measurable outcome at the end of the year and the end of the current quarter. Assignable – specify what resources are needed to achieve the measurable outcome. Realistic – state what results can realistically be achieved, given available resources and compare with Measurable and Assignable above. Time-related – specify when the result(s) can be achieved (end of year, end of quarter). SMART criteria are commonly attributed to Peter Drucker's management by objective concept. The first-known use of the term occurs in the November 1981 issue of Management Review by George T. Doran. Successful growth companies not only master Quadrant 2, they build a culture in which they thrive and celebrate putting Quadrant 2 issues before any others with one exception – Quadrant 1 issues. Mastering the planning process gives you the ability to handle Quadrant 1 issues – those that are both urgent and important – when it is necessary to prioritize them above all else. It is much easier to pause some or all of the Quadrant 2 issues while Quadrant 1 takes priority and then fall back into the rhythm of executing Quadrant 2 because of the prior planning that was done. As General Dwight Eisenhower, the person in charge of planning the Allied invasion of Europe during World War II, once said: “Plans are nothing; planning is everything.” While Eisenhower was making the point that it is the planning process, not a documented plan, which leads to success, he also understood that after you completed an extensive and thorough planning process and developed a plan, it was much easier to react to an unknown mission critical issue. From experience, this is a key component to achieving the freedom we all desire to be working on those things that matter to us most.